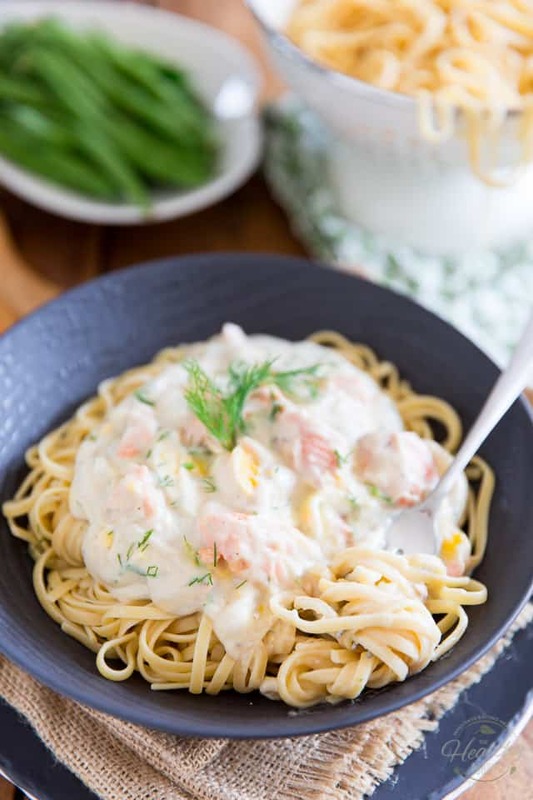 Big chunks of salmon, slices of eggs, a hint of fresh dill, all brought together by a rich and creamy… cauliflower sauce, this dairy free Creamy Egg and Salmon Pasta might seem super indulgent, but it’s loaded with all the good stuff that’ll do your body good! 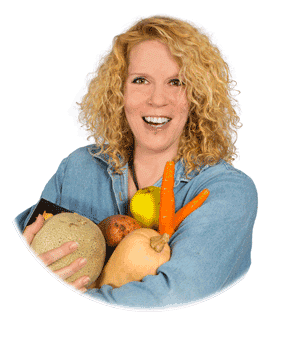 Last week, I had some leftover cooked salmon in the fridge and wasn’t quite sure what I was gonna do with it… I’ve no doubt that you know the feeling all too well, right? 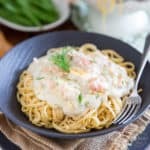 So, I racked my brains and eventually got the inspiration for this Creamy Egg and Salmon Pasta from a dish that my parents used to make when I was a kid. 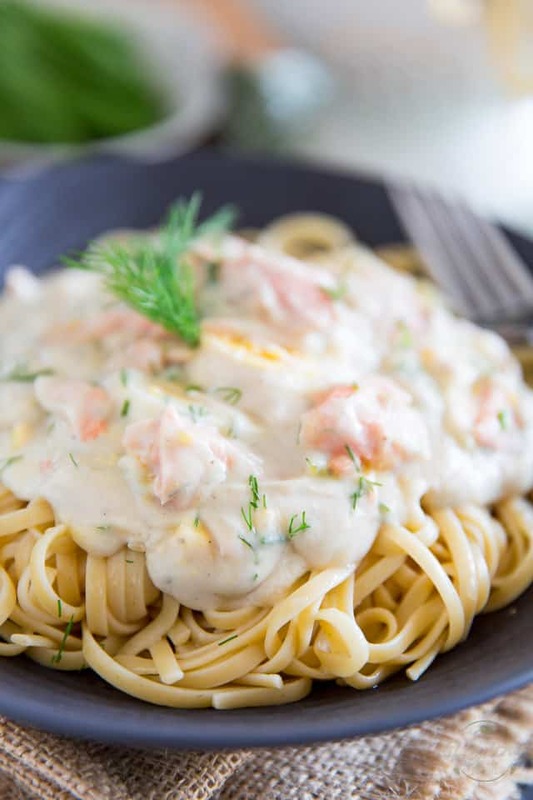 It was fairly similar to this, except it didn’t have any salmon in it, and it would get served with a side of home made fries… Oh, and also too, their dish was made with a true bechamel sauce, complete with milk, butter and flour, you know! 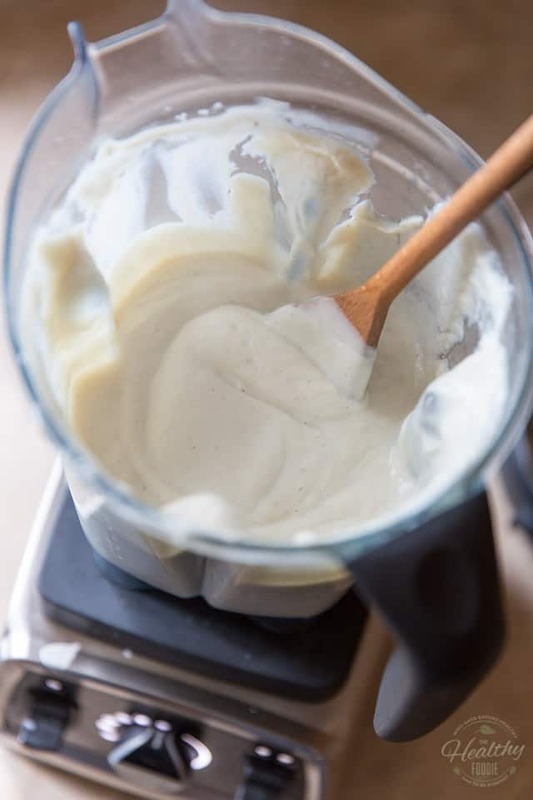 Over the years, I’ve grown quite fond of my dairy free cauliflower bechamel, so I decided to use this alternative instead, and I must say that it was a very good decision. 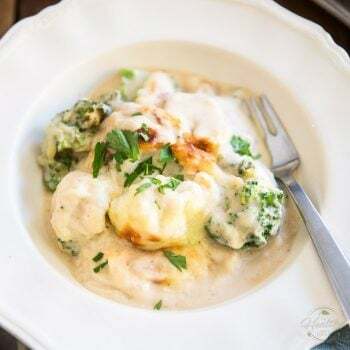 In the end, I loved absolutely everything about this dish: it feels super rich and creamy, it’s super tasty and satisfying, it’s crazy good for you... and is probably my new favorite way ever of using up leftover cooked salmon! 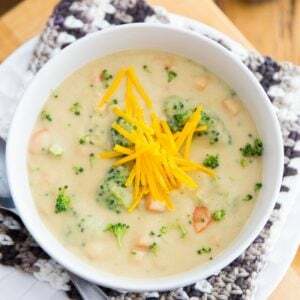 Next time you too, find yourself with some leftover cooked salmon and aren’t too sure what to do with it, try this; I’m certain that you won’t regret it. Your first course of action should be to bring plenty of salted water to the boil and cook your pasta (I chose to use linguini, but any pasta will do, really!) until it’s done to your liking. While that’s happening, heat a few tablespoons of olive oil in a large saucepan set over medium heat. 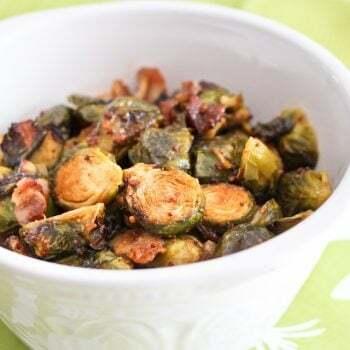 To it, add some chopped onion, garlic, salt and pepper and cook that for 2 to 3 minutes, until fragrant and slightly softened. 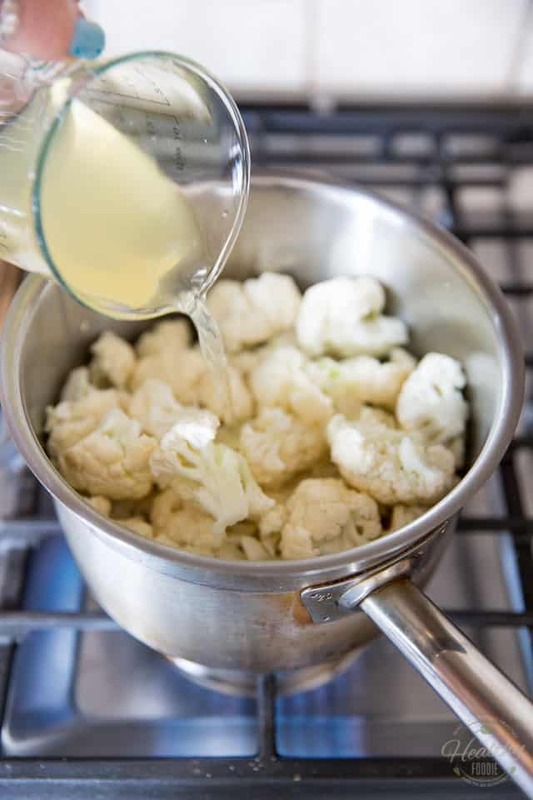 Next, add the cauliflower florets and chicken broth (feel free to use bone broth or vegetable stock, if you prefer), cover and bring to the boil; lower the heat and continue cooking until the cauliflower is really tender and practically falls apart, about 5-7 minutes. 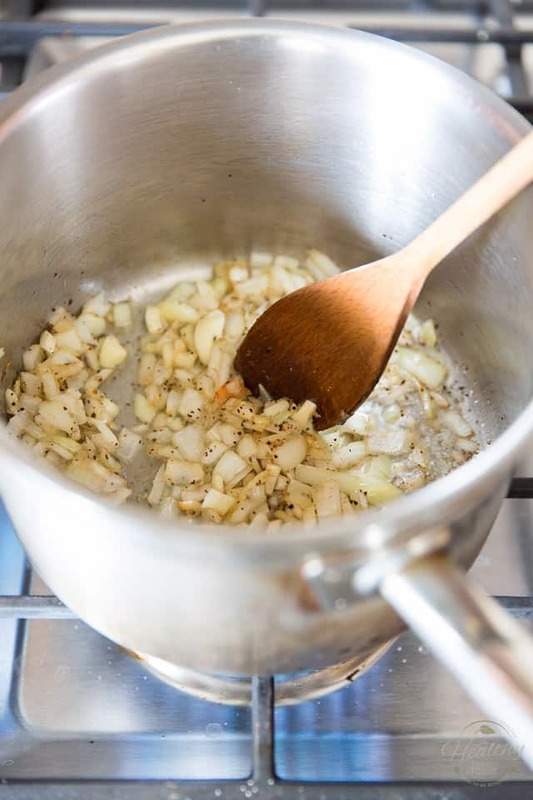 …and process on high until your sauce becomes super smooth and silky. 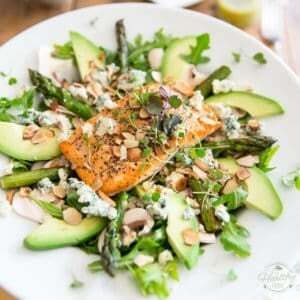 Note that if you didn’t have any leftover cooked salmon on hand you could very well use canned salmon instead! Or even replace it with cooked chicken, or more eggs, why not? 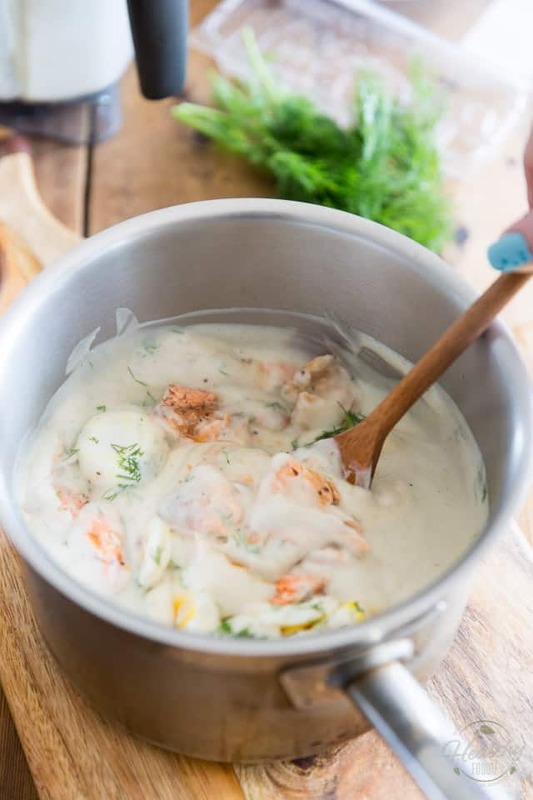 Stir very delicately so you don’t break the eggs and delicate pieces of fish and return the pan to the heat source if necessary, cooking over low heat for a few minutes, until the eggs and salmon are heated through. Serve over your choice of cooked pasta and garnish with more dill, if desired. 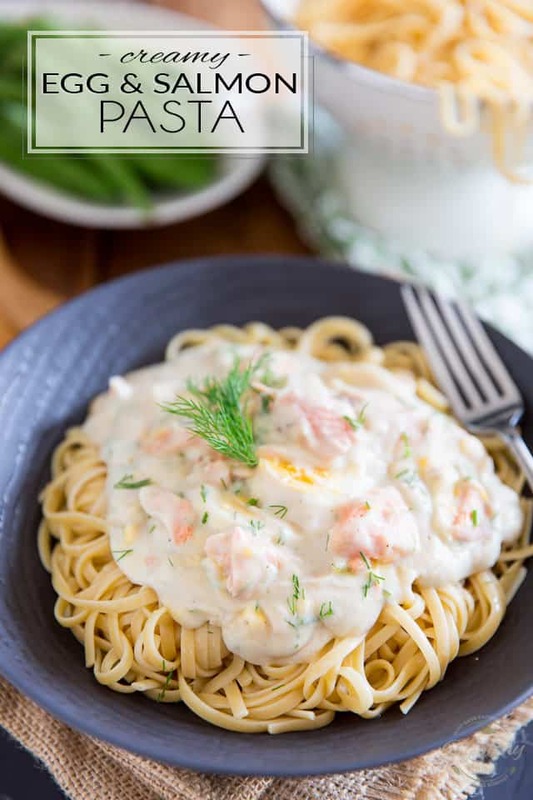 Chunks of salmon, slices of eggs, a hint of fresh dill, all brought together by a rich and creamy... cauliflower sauce, this dairy free Creamy Egg and Salmon Pasta might seem super indulgent, but it's loaded with all the good stuff that'll do your body good! Bring plenty of salted water to the boil and cook the pasta until cooked to your liking, then drain. Meanwhile, heat a few tablespoons of olive oil in a large saucepan set over medium heat. Add onion, garlic, salt and pepper and cook for 2-3 minutes, until fragrant and slightly softened. 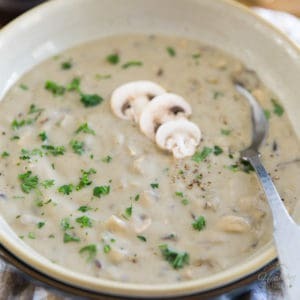 Add cauliflower florets and chicken stock, cover and bring to the boil; lower the heat and continue cooking until the cauliflower is really tender and practically falls apart, about 5-7 minutes. 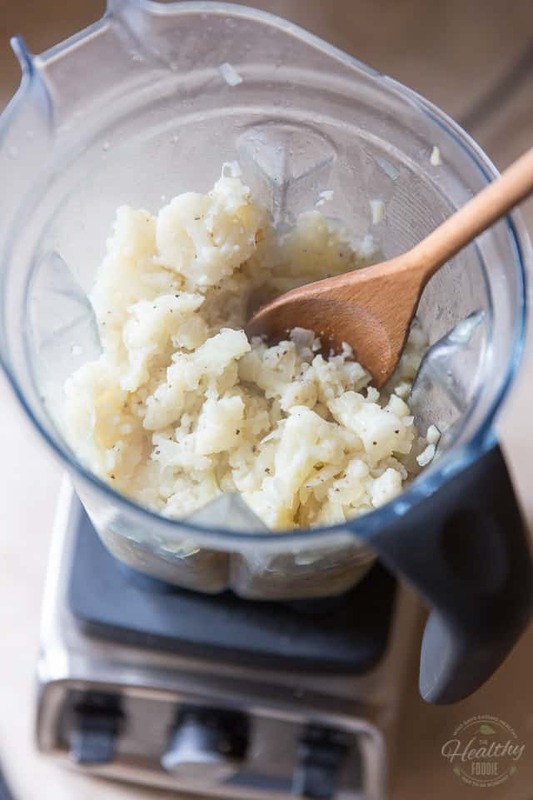 Carefully transfer this to your high speed blender and process on high until super smooth and silky, then return it to the pot. 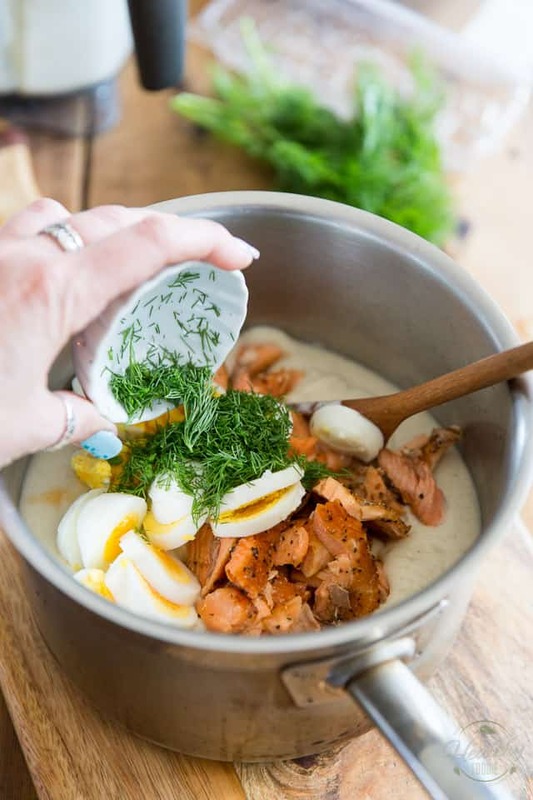 Delicately stir in the eggs, salmon and dill; continue cooking over low heat for a few minutes, until the eggs and salmon are heated through. Serve over the cooked pasta and garnish with more dill, if desired. How did you know about that leftover salmon in my frig???? 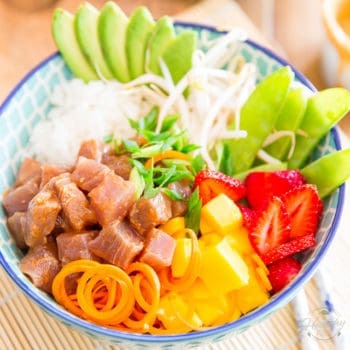 This looks so good, thanks for the idea! I have a ninja blender is that high speed enough? I’m fairly certain it is. I honestly can’t say if I would include a boiled egg in this email. It’s a texture thing for me and I may not enjoy the combination. But, minus the egg, it’s a good recipe to try. 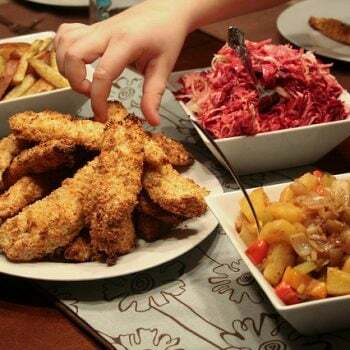 Thank you for the wonderful recipe. I followed it tonight: dinner was delicious. You are very welcome! And thank YOU for the kind words! 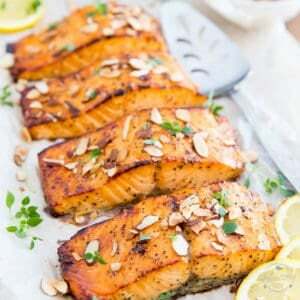 I’m going to cook some salmon just to make this and serve it over zoodles. Thank you for this recipe.